“Class Notes” are a flexible way for students to let other members know about classes they have enjoyed very much. Please send an email to communications@olliatduke.org with a brief description of the class, why it is noteworthy to you, the instructor’s name and 1 or 2 pictures. Enjoy browsing class notes, and thanks to all the contributors for sharing their experiences. solution. We set to work making our patterns with clothespins, clamps, wood and plastic shapes and string to create areas that resist the dye. After a 10 minute dunk in the solution, we watched the greenish fabric come out of the indigo solution and, through the oxidation process, turn blue before our eyes when hung on the fence! Catherine Cross Tsintzos demonstrates the technique. The Winter 2018 class titled Le Siècle des Lumières (The Enlightenment) celebrated the end of the term with a party at the Bishop’s House in April. Claire Davidshofer taught this advanced French class, which reviewed the literature and philosophers during the reigns of Louis XV and Louis XVI. Fun was had by all! 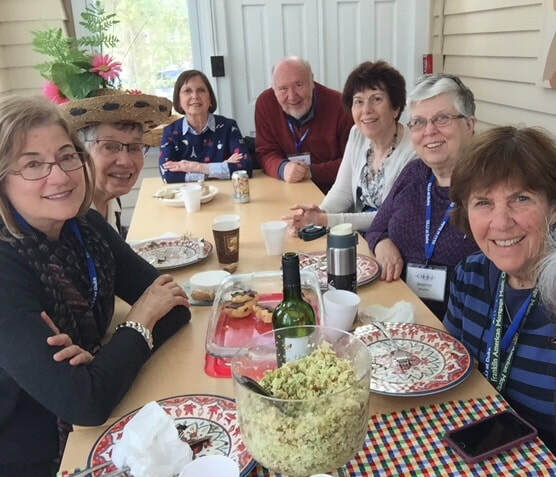 OLLI at Duke students were recently privileged to take a course with Barbara Tyroler. 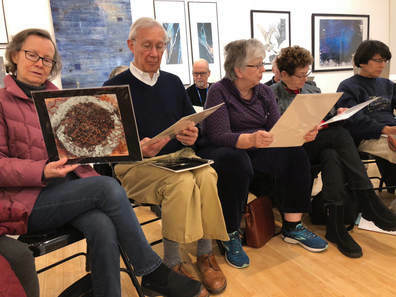 The class was held in the FRANK gallery, and was designed to provide firsthand exposure to some of the best of regional art, as well as to interact directly with 15 or so of the artists who belong to this non-profit co-op gallery. Artists discussed how they came to their career, the evolution of their art, the complex techniques involved in producing it, and some of what they work at expressing, as they passed around or displayed their creative work. 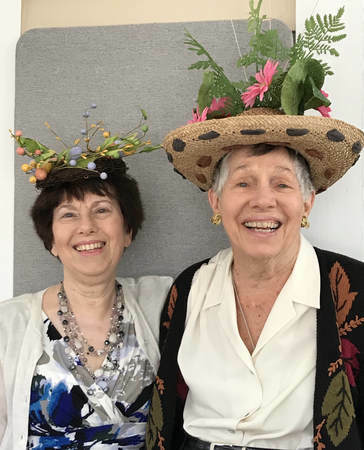 Roxanne Lorch (who was the volunteer class assistant) noted: "These artists were captivating in sharing how their personal histories informed their work. 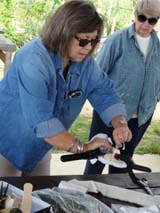 There was great communication and rapt attention at every class." 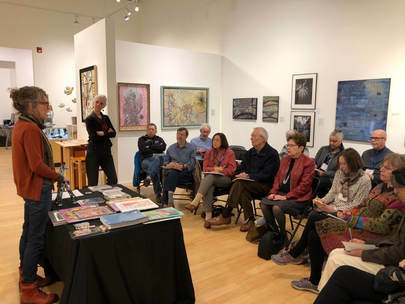 OLLI students learn about an artist's career and the evolution of their art from Sudie Rakusin (at the table on the left) and Susan Filley (standing). OLLI Students had the opportunity to touch and examine art works 'close up and personal'. 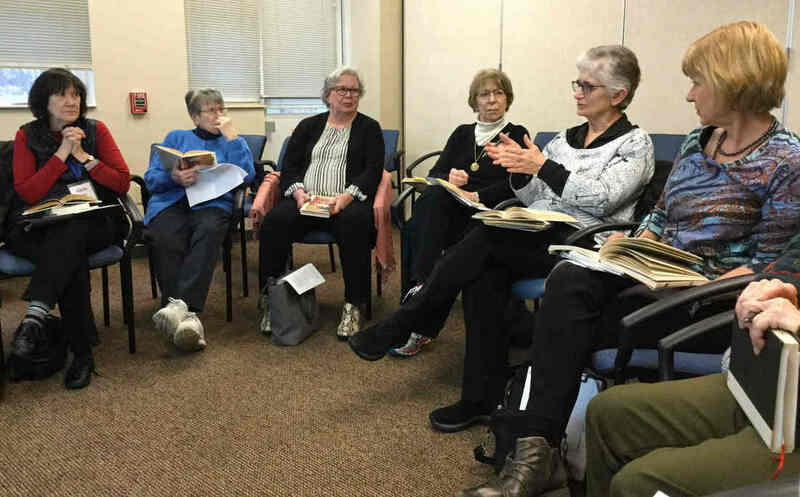 A great way to connect and really learn about fellow OLLI members is to take a literature discussion class. 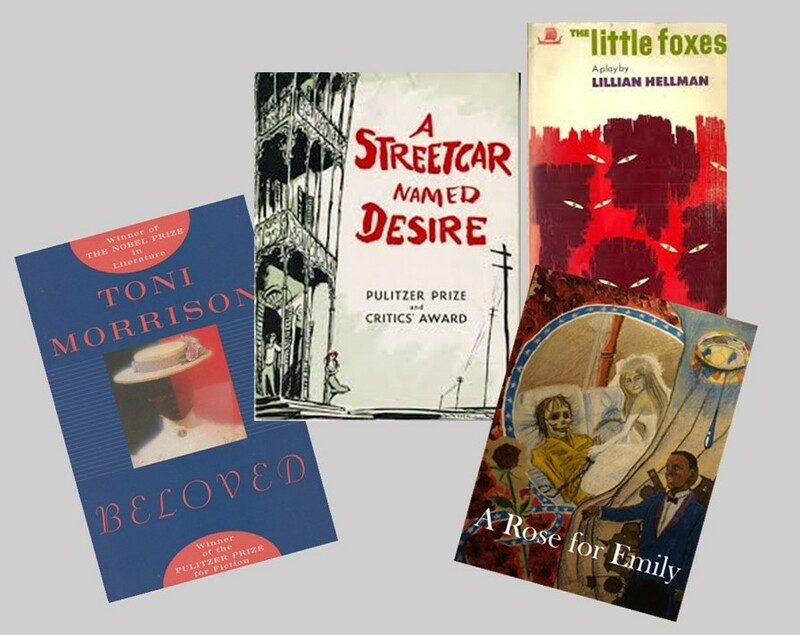 This Winter Term, Marjorie Lancaster facilitated Difficult Women, a class that explored strong yet flawed literary women characters in a series of readings including Lillian Hellman’s The Little Foxes, Tennesee William’s A Street Car Named Desire, and Toni Morrison’s Beloved. In each discussion we openly shared our thoughts and sometimes bared our souls and our own flaws. 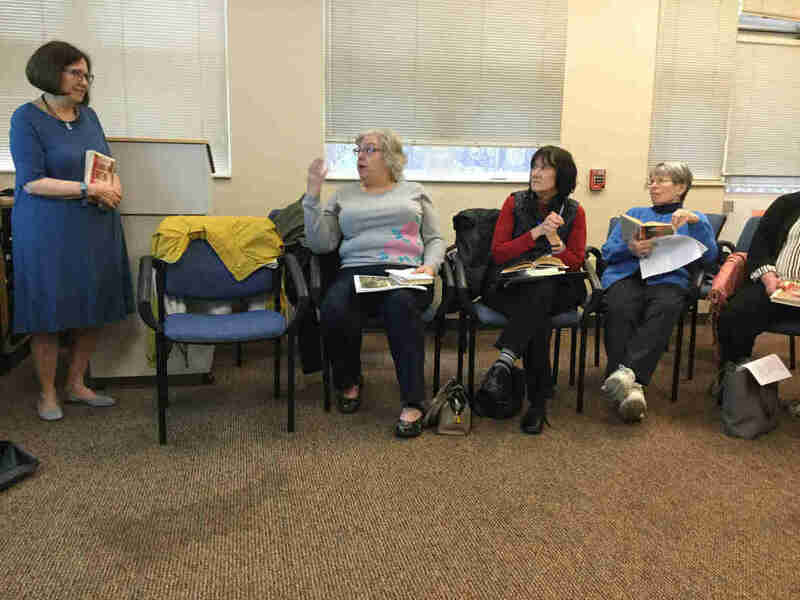 As you will see in pictures from our last class that focused on Tony Morrison’s work revealing the depths of ill in America’s slavery and the profound impacts on the souls of the characters, discussion was lively and engaging. The instructor provided guidance for difficult text, expanded content to film and other sources, and masterfully managed and encourage class participation. One of the best OLLI literature classes I have taken in five years. I love hearing the comments from other readers. It helps me understand the writing better. It’s wonderful to sit in a room with such a diverse group of women as we discuss the readings. I loved this class! Great selection of Interesting short stories and novels to read, with lots of background information on authors and their writings. I especially enjoyed the class discussions. I had read several of the selections before, but I now understand them and appreciate them so much more. The movies -- in-class clips and suggestions for viewing outside of class -- were an added bonus. I look forward to taking more of Marjorie Lancaster's classes. Excellent choice of material. Wonderful discussions led by Marjorie Lancaster who was welcoming and open to questions from the group. Women are complex; and difficult women are not necessarily strong women. But we are bound by motherhood, relationships, illness and courage. All the stories we read had all complex women characters. 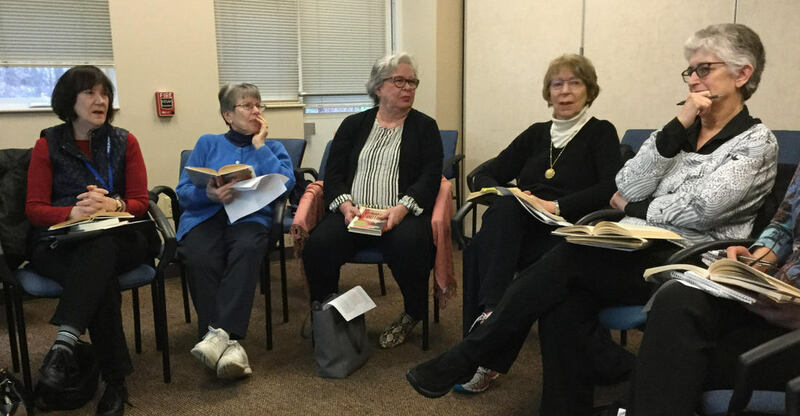 Marjorie will be teaching / facilitating Robert Penn Warren’s All The King’s Men in the Spring. This book is timeless and terribly relevant today. Some of the readings in the class, "Difficult Women"
Marjorie Lancaster facilitating class discussion. Class participants engaged in thoughtful and reflective discussions. Everyone was encouraged to engage; and they all did. Zentangle is a meditative drawing practice developed by Maria Thomas and Rick Roberts that creates beautiful images from repetitive patterns. 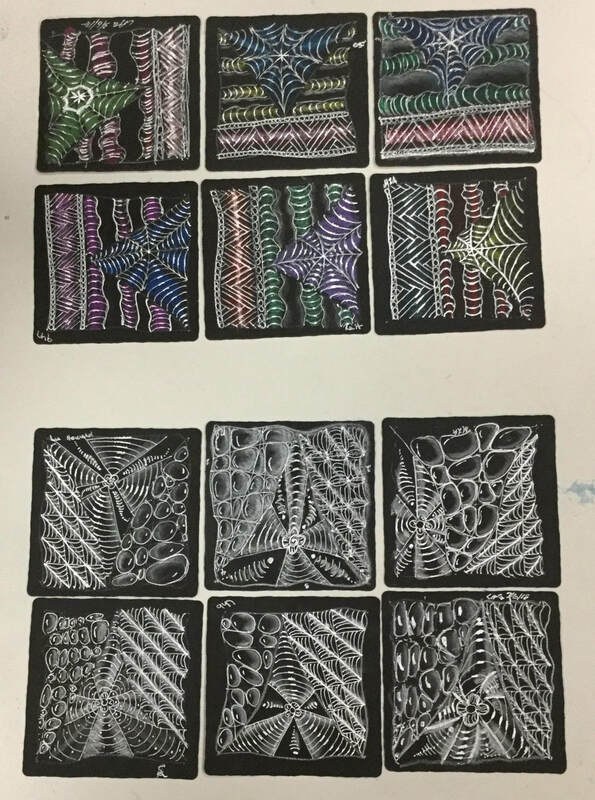 Cathy Boytos taught Introduction to Zentangle this winter in which we learned the steps to creating a Zentangle tile and 9 different tangle patterns. Traditionally Zentangle tiles are done with black pigment pen on white 4”x4” tiles. 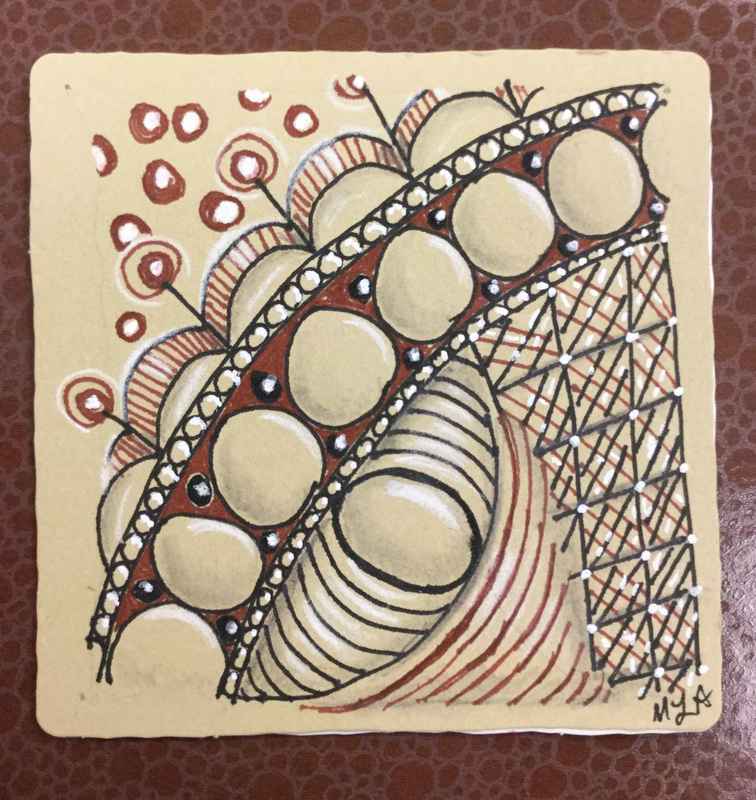 ‘Renaissance’ tiles are done on tan paper tiles and drawn with a ‘sienna brown’ pigment pen. ​Zentangles are also drawn on ​black tiles with white ink. ​While we all did the same tiles and patterns, each one of us created a unique reflection of ourselves. A collage of tiles created by the class. 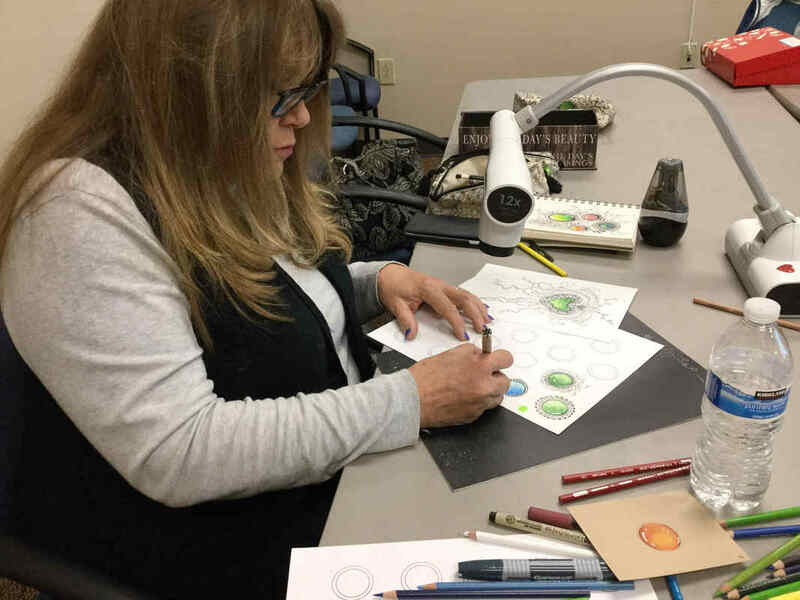 If you can draw a small straight line, an S curve, and an arc or circle, you too can create stunning tiles and enjoy the peaceful, Zen-like moments of this drawing practice. Cathy Boytos demonstrates coloring techniques for tangle motifs. A bird image showing different tangle patterns taught in class. An example of a Zentangle on a black tile drawn by Lu Howard. An example of 'Gem' Zentangles that the class created. 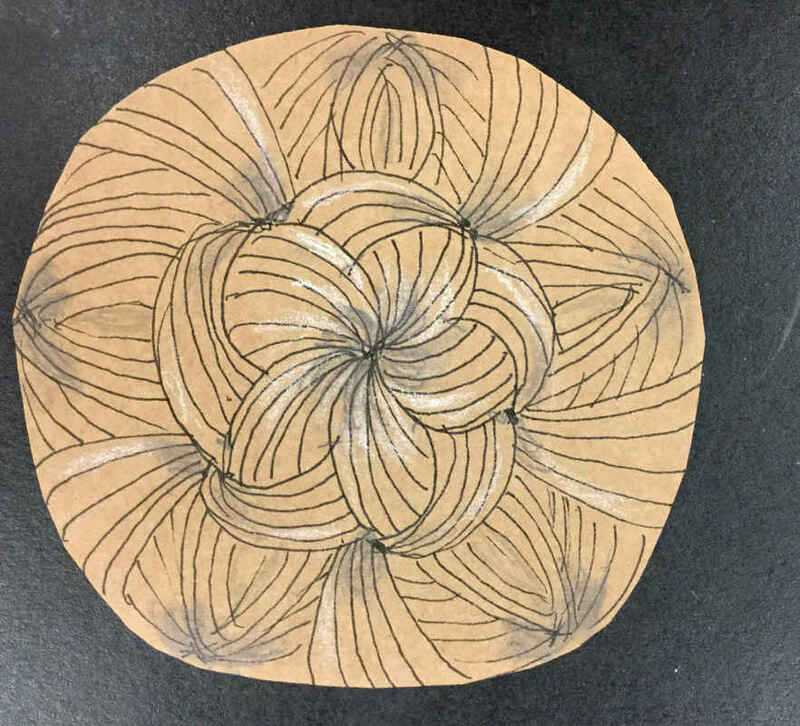 A Zentangle created by Sally Adkin using a brown paper bag cutout for a tile.